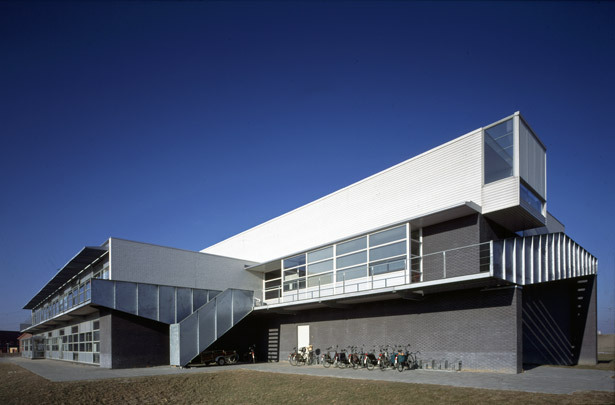 The two schools in Amsterdam established Hertzberger’s reputation as one of the few architects able to experiment with new school building types within the tightest of tight budgets allotted to this sector. The two large primary schools he built in Almere with three years in-between have a linear parti in common, with classrooms strung out either side of an elongated open central area for communal activities. In the Polygoon the open space is filled with a spine of facilities linked by aerial walkways to a roof terrace perched above the classrooms. The Bombardon, for its part, can be regarded as an extrusion of the Apollo Schools, with its oblique stairs and bridges stabbing through the open central zone.